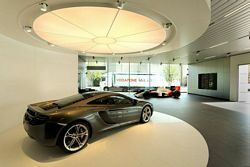 McLaren will open its first showrooms in Germany today (20th July) with McLaren Düsseldorf and McLaren Hamburg set to open their doors in time for the 2011 Formula 1™ German Grand Prix which will take place at the Nürburgring this coming weekend. A total of four dealers in Germany were selected by McLaren to offer the best in customer sales and service for a range of McLaren cars, beginning with the ground-breaking new MP4-12C high-performance sports car. Every showroom will exhibit a piece of history to highlight McLaren’s rich heritage with each McLaren showroom displaying a real McLaren race car, driven by some of the finest racing drivers in the world. Customers in Düsseldorf can look forward to MP4/5 which took Alain Prost to a world championship title in 1989, while Hamburg’s car enthusiasts will be impressed with MP4/6, the car in which Ayrton Senna won his third, and last championship title, in 1991. The remaining two dealers in Frankfurt and Munich will open in autumn this year. 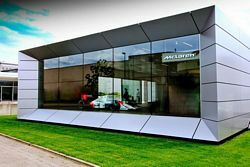 Available video footage includes an edited and b-roll version of the showroom opening events as well as sound bites from McLaren Automotive Sales Manager for Germany, Andrew Skey, and McLaren Düsseldorf Brand Manager, Jens Nothelle.